Neal Hawkins has a new title and new responsibilities at the Institute for Transportation (InTrans) at Iowa State University. Hawkins has been named the associate director of InTrans, where he has been a researcher and center director in traffic operations, roadway safety, and asset management since 2003. In his new role, Hawkins will lead efforts in strategic planning, economic development, and external and internal relations, and seek opportunities to create new interdisciplinary research and outreach projects. He will continue to lead an active research program. 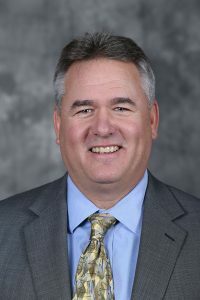 Hawkins currently is the director of two InTrans centers: CTRE (Center for Transportation Research and Education) and CWIMS (Center for Weather Impacts on Mobility and Safety). He also is manager of the Federal Highway Administration’s Aurora Pooled Fund for Roadway Weather Information Systems, and he is an adjunct lecturer in civil engineering at ISU. Before coming to InTrans in 2003, Hawkins was a traffic engineer for the City of Des Moines and was a senior project manager for HR Green, a regional engineering and consulting firm. Hawkins has two degrees in civil engineering, a B.S. from the University of Oklahoma and an M.S. from ISU.